Kick start your day with a breakfast that delivers on taste as well as nutrition. Goodness tastes great when it's a special muesli sweetened the natural way with pieces of real fruit. Flahavan's Hi8 is the enjoyable way to stay healthy and keep your energy levels where they should be. Flahavan's have been milling quality oats at the family mill beside the River Mahon in Kilmacthomas, Co. Waterford for over 200 years. Here we select the finest ingredients and prepare them with the same attention to quality as ever. We are proud of our HI 8 muesli and we hope you enjoy it too. Some gradual hardening of fruit over time. To redistribute, turn bag upside down and shake gently. 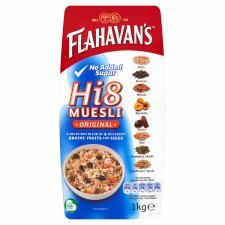 If this product should fall below the high quality that you associate with Flahavan's, please return the packet and contents to the Customer Services Manager stating when and where it was purchased or email your query to customerservices@flahavans.ie. This guarantee does not affect your statutory rights. Store in a cool dry place away from strong smelling products. Once opened, reseal or store in an airtight container to maintain freshness.